Argentina, filming “Fly Fishing the World” (Mark Daly) Mark Daly owner/operator of Cascade outfitter, Mark has appeared in and has been featured in many magazines including: “Sporting Classics”,” Rod and Reel”, “Field and Stream”, “Cigar Aficionado”, and Deltas “Departures” Magazine and has worked and been featured on “ESPN” Fly Fishing The World”. Mark is a long time guide and outfitter on the Missouri River, first fishing the upper Missouri while attending the U Of Montana in 1977. All trips include transportation to and from the river, a top quality streamside lunch, and beverages. Also, flies, all terminal tackle( tippet etc..), if needed rods & reels can be supplied if told in advance. Please compare prices with “Local guides” with “Local knowledge” of the Missouri River with “out of area guides”, who specialize in other rivers. Why pay more to catch less fish? A 50% deposit is required on all trips booked in advance. Deposits refunded with one month notice of cancellation, any cancellation with less than one month notice, will not be refunded. Each cancellation will be reviewed on an individual basis, and, in most cases, the deposits can be used for future trips. Trout rod- #3—#7, whatever you prefer, and trout reel with a drag system. 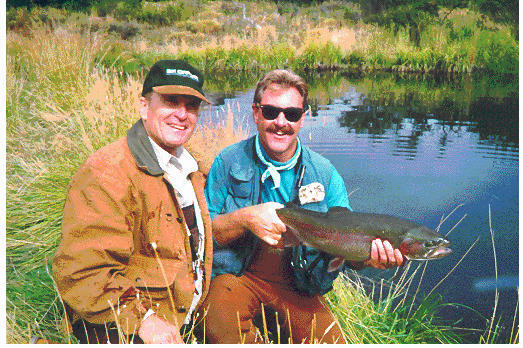 Sunglasses, sunscreen (25-50), Raincoat, waders, (lightweight for summer), your favorite trout flies, and fishing vest. Hat to keep the sun at bay, and your camera for that “special” Missouri river fish you’re going to catch! It’s great to get a photo of that “special” fish. It can be a fish that fought and jumped like no other, it can be a beautiful brown, a huge rainbow, maybe it was a tough fish caught on a small dry fly, something to make it special. But, we need to try and limit from taking photos of so many fish, and when we do take photos, we need to be ready and be quick, keep the photos for those “special” fish. Please, bring a good attitude, and Have fun!